Steve Simpson has worked with the Million Dollar Band in various capacities for 25 years. Currently his duties with the marching band include overseeing the Color Guard program. In 2006, Mr. Simpson founded the University of Alabama Alta Marea (Italian for High Tide) Winterguard. In their inaugural season of competition, they were the Southeastern Color Guard Circuit Championships Independent A Class Silver Medal winner and a Winter Guard International World Championships Independent A Class finalist. Mr. Simpson is a graduate of The University of Alabama where he was a member of the Million Dollar Band and the University Symphonic Band. 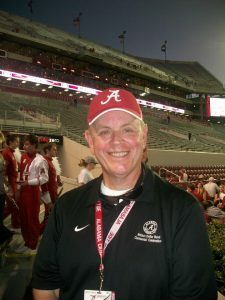 Prior to joining the Million Dollar Band staff, Mr. Simpson was a band director at Tarrant Middle School and W. A. Berry High School, both in Birmingham, Alabama. In addition to his duties with the Million Dollar Band, Mr. Simpson is coordinator and contest director for the Festival of Champions band competition. He is also a consultant and festival coordinator for the National Band and Orchestra Festival held at Carnegie Hall in New York.